Are you planning a construction project that will include a variety of building types? Do you want to know the difference in cost across a range building types? 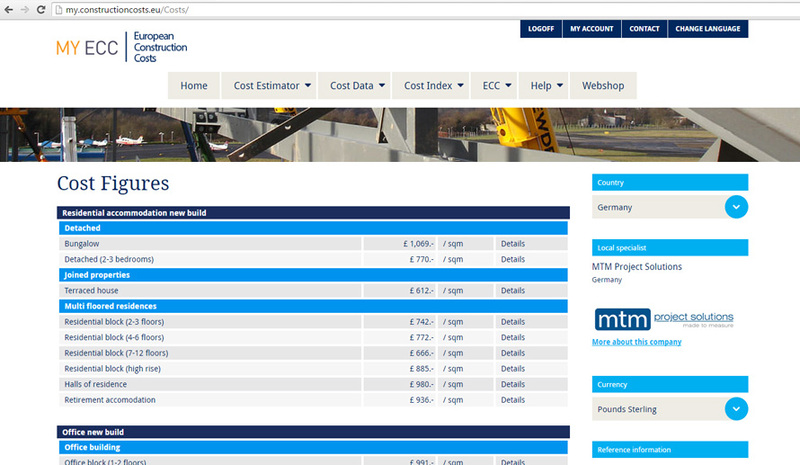 ECC provides detailed construction cost data for various building types in a growing number of European countries. If you want to know whether cost information is currently available for a specific country, please consult the list of supported building types below. We provide both [Level 1] and [Level 2] cost data for various countries and building types. If you cannot find the information you are looking for, please contact our team directly. We are always happy to assist you any way we can. • level 1	? Information is presented as construction costs per square meter. These headline figures are based on a statistical average of such constructions. The construction costs have been provided and are updated regularly by the local cost specialist. See the glossary for more information. • level 2	? Information is presented as a breakdown of the construction costs in a detailed schedule. The local cost specialist has calculated the construction costs on a standard building model with its national variations. The construction costs are updated regularly by the local cost specialist. See the glossary for more information.